The chairs of Chippendale and his school are very characteristic. 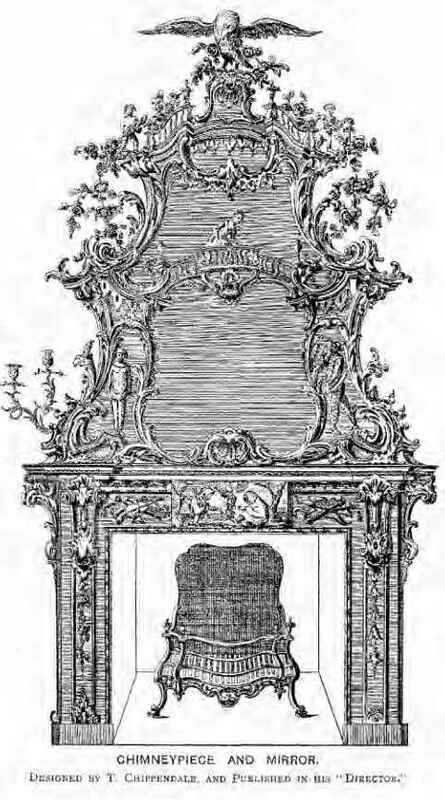 If the outline of the back of some of them be compared with the stuffed back of the chair from Hardwick Hall (illustrated in Chap. IV.) it will be seen that the same lines occur, but instead of the frame of the back being covered with silk, tapestry, or other material—as in William III. 's time—Chippendale's are cut open into fanciful patterns; and in his more highly ornate work, the twisted ribands of his design are scarcely to be reconciled with the use for which a dining room chair is intended. The well-moulded sweep of his lines, however, counterbalances this defect to some extent, and a good Chippendale mahogany chair will ever be an elegant and graceful article of furniture. One of the most graceful chairs of about the middle of the century, in the style of Chippendale's best productions, is the Master's Chair in the Hall of the Barbers' Company. Carved in rich Spanish mahogany, and upholstered in morocco leather, the ornament consists of scrolls and cornucopia, with flowers charmingly disposed, the arms and motto of the Company being introduced. Unfortunately, there is no certain record as to the designer and maker of this beautiful chair, and it is to be regretted that the date (1865), the year when the Hall was redecorated, should have been placed in prominent gold letters on this interesting relic of a past century. Apart from the several books of design noticed in this chapter, there were published two editions of a work, undated, containing many of the drawings found in Chippendale's book. This book was entitled, "Upwards of One Hundred New and Genteel Designs, being all the most approved patterns of household furniture in the French taste. By a Society of Upholders and Cabinet makers." It is probable that Chippendale was a member of this Society, and that some of the designs were his, but that he severed himself from it and published his own book, preferring to advance his individual reputation. 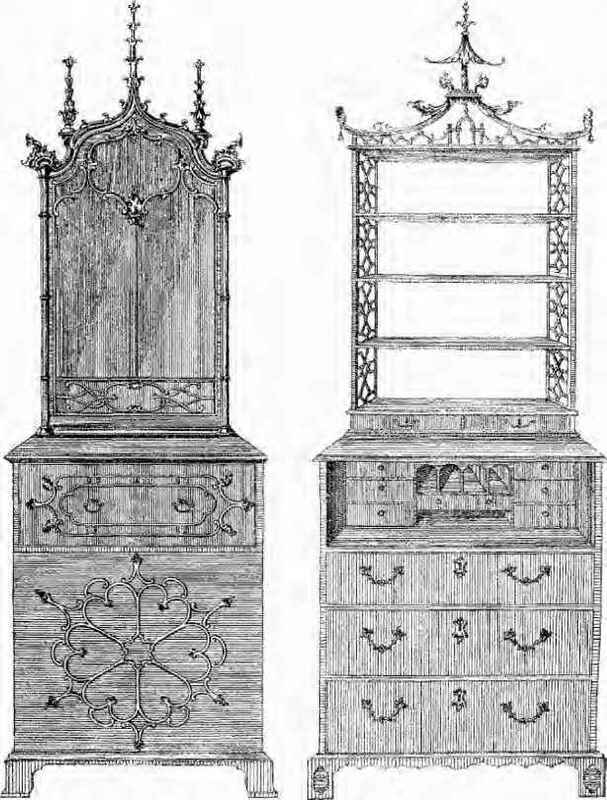 The "sideboard" which one so generally hears called "Chippendale" scarcely existed in his time. If it did, it must have been quite at the end of his career. There were side tables, sometimes called "Side-Boards," but they contained neither cellaret nor cupboard: only a drawer for table linen. The names of two designers and makers of mahogany ornamental furniture, which deserve to be remembered equally with Chippendale, are those of W. Ince and J. Mayhew, who were partners in business in Broad Street, Golden Square, and contemporary with him. 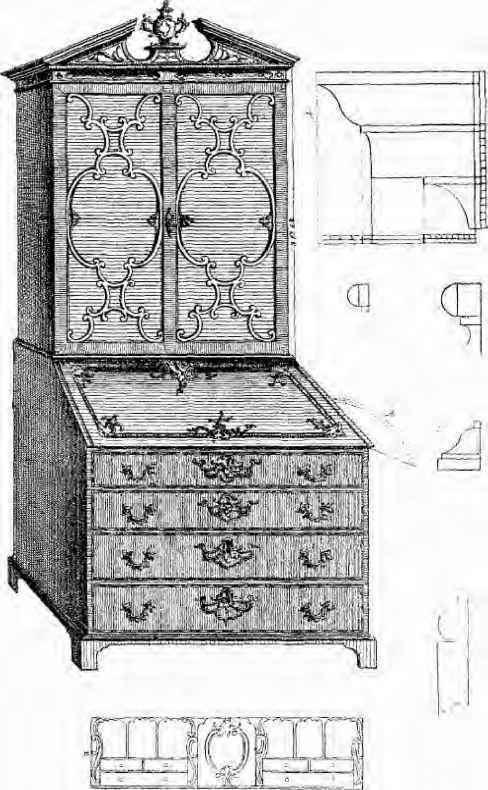 They also published a book of designs which is alluded to by Thomas Sheraton in the preface to his "Cabinet Maker and Upholsterer's Drawing Book," published in 1793. 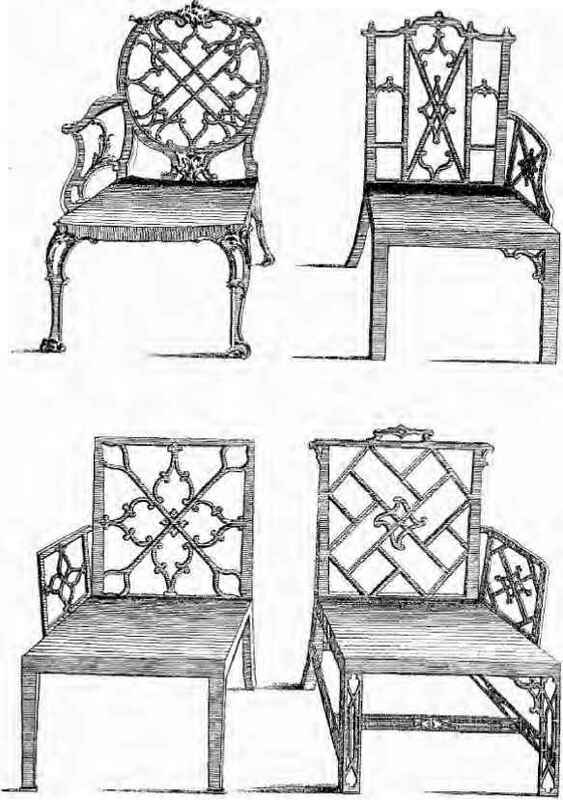 A few examples from Ince and Mayhew's "Cabinet Maker's Real Friend and Companion" are given, from which it is evident that, without any distinguishing brand, or without the identification of the furniture with the designs, it is difficult to distinguish between the work of these contemporary makers. 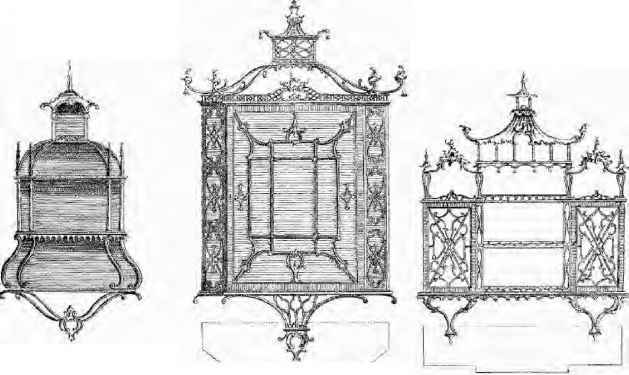 It is, however, noticeable after careful comparison of the work of Chippendale with that of Ince and Mayhew, that the furniture designed and made by the latter has many more of the characteristic details and ornaments which are generally looked upon as denoting the work of Chippendale; for instance, the fretwork ornaments finished by the carver, and then applied to the plain mahogany, the open-work scroll-shaped backs to encoignures or china shelves, and the carved Chinaman with the pagoda. Some of the frames of chimney glasses and pictures made by Ince and Mayhew are almost identical with those of Chippendale. Other well known designers and manufacturers of this time were Hepplewhite, who published a book of designs very similar to those of his contemporaries, and Matthias Lock, some of whose original drawings were on view in the Exhibition of 1862, and had interesting memoranda attached, giving the names of his workmen and the wages paid: from these it appears that five shillings a day was at that time sufficient remuneration for a skilful wood carver. Another good designer and maker of much excellent furniture of this time was "Shearer," who has been unnoticed by nearly all writers on the subject. 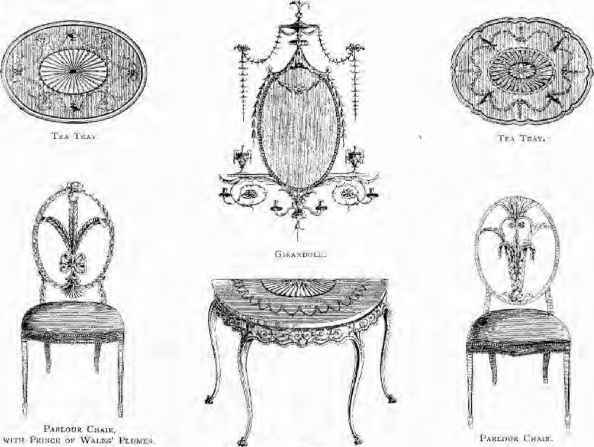 In an old book of designs in the author's possession, "Shearer delin" and "published according to Act of Parliament, 1788," appears underneath the representations of sideboards, tables, bookcases, dressing tables, which are very similar in every way to those of Sheraton, his contemporary. 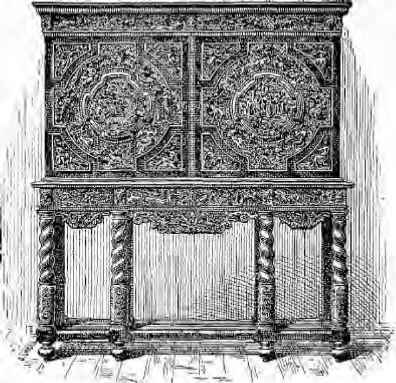 "English taste and workmanship have of late years been much sought for by surrounding nations; and the mutability of all things, but more especially of fashions, has rendered the labours of our predecessors in this line of little use; nay, in this day can only tend to mislead those foreigners who seek a knowledge of English taste in the various articles of household furniture." Ct-ji>\ t.íi-nii..mi' :v w i i .(:■! -'i 1 ■■■■ I ■■ i ilULO^I r ¥ [li ■ I" ■ 1'jít.t ¡ í'Ll Vi , i. i : . i ■■ ■ . It is amusing to think how soon the "mutabilities of fashion" did for a time supersede many of his designs. A selection of designs from his book is given, and it will be useful to compare them with those of other contemporary makers. From such a comparison it will be seen that in the progress from the rococo of Chippendale to the more severe lines of Sheraton, Hepplewhite forms a connecting link between the two. "Knife cases," for the reception of the knives which were kept in them, and used to "garnish" the sideboards. "Confidante" and "Duchesse," which were sofas of the time. 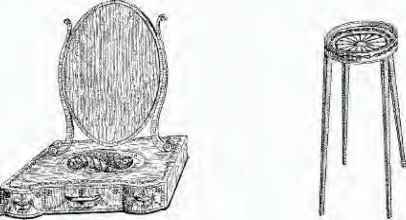 "Gouty stool," a stool having an adjustable top. "Tea chest," "Urn stand," and other names which have now disappeared from ordinary use in describing similar articles. Hepplewhite had a spécialité, to which he alludes in his book, and of which he gives several designs. This was his japanned or painted furniture: the wood was coated with a preparation after the manner of Chinese or Japanese lacquer, and then decorated, generally with gold on a black ground, the designs being in fruits and flowers: and also medallions painted in the style of Cipriani and Angelica Kauffmann. Subsequently, furniture of this character, instead of being japanned, was only painted white. 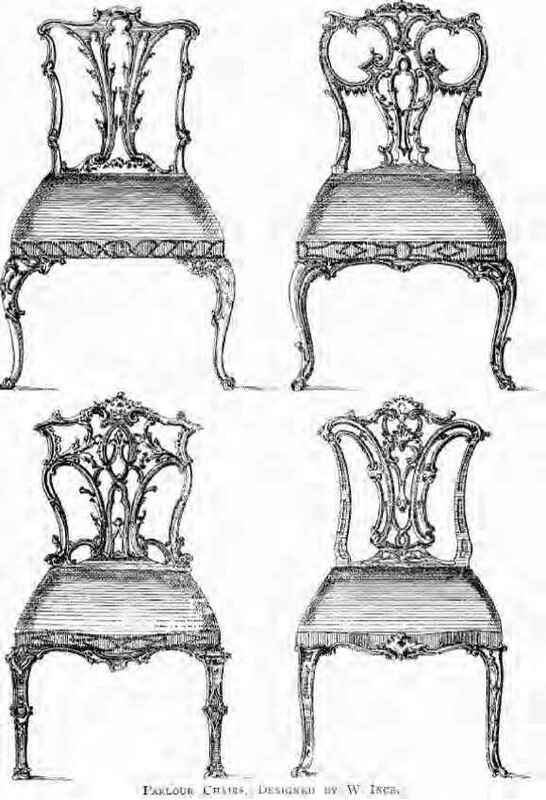 It is probable that many of the chairs of this time which one sees, of wood of inferior quality, and with scarcely any ornament, were originally decorated in the manner just described, and therefore the "carving" of details would have been superfluous. Injury to the enamelling by wear and tear was most likely the cause of their being stripped of their rubbed and partly obliterated decorations, and they were then stained and polished, presenting an appearance which is scarcely just to the designer and manufacturer. 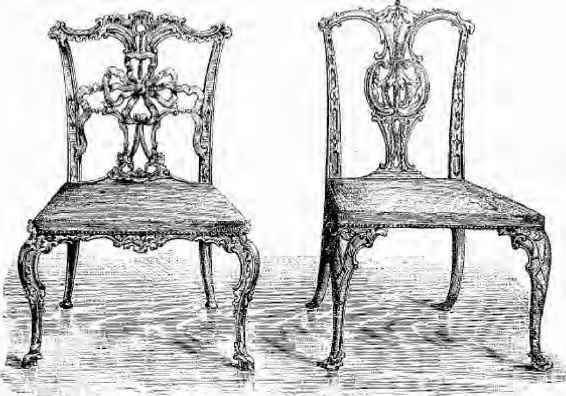 In some of Hepplewhite's chairs, too, as in those of Sheraton, one may fancy one sees evidence of the squabbles of two fashionable factions of this time, "the Court party" and the "Prince's party," the latter having the well known Prince of Wales' plumes very prominent, and forming the ornamental support of the back of the chair. Another noticeable enrichment is the carving of wheat ears on the shield shape backs of the chairs. 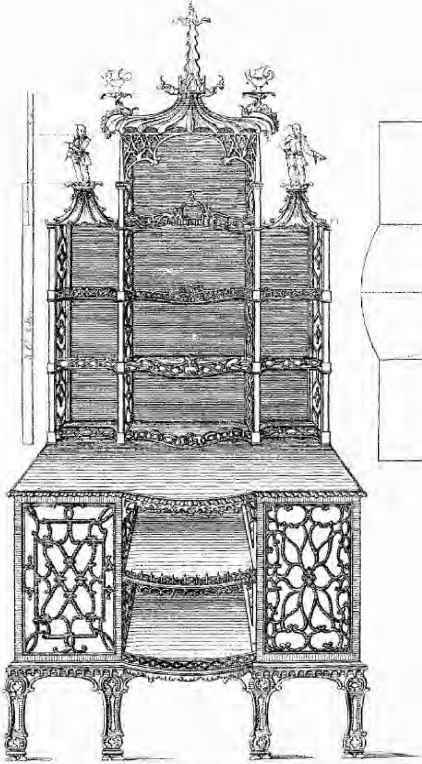 "The plan of a room shewing the proper distribution of the furniture," appears on p. 193 to give an idea of the fashion of the day; it is evident from the large looking glass which overhangs the sideboard that the fashion had now set in to use these mirrors. Some thirty or forty year later this mirror became part of the sideboard, and in some large and pretentious designs which we have seen, the sideboard itself was little better than a support for a huge glass in a heavily carved frame. It was not until 1800 that Richard Gillow, of the well-known firm in Oxford Street, invented and patented the convenient telescopic contrivance which, with slight improvements, has given us the table of the present day. The term still used by auctioneers in describing a modern extending table as "a set of dining tables," is, probably, a survival of the older method of providing for a dinner party. 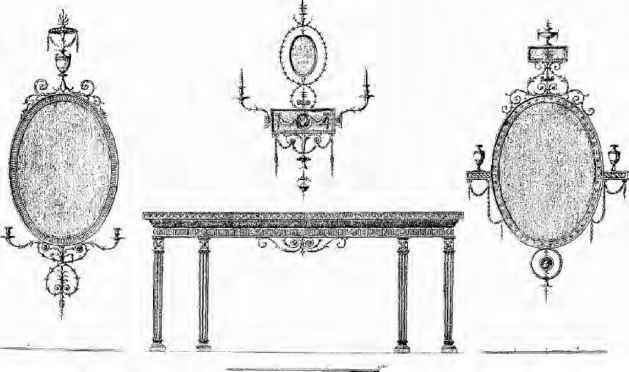 Gillow's patent is described as "an improvement in the method of constructing dining and other tables calculated to reduce the number of legs, pillars and claws, and to facilitate and render easy, their enlargement and reduction."